My primary goal in building this site was to save myself time in doing my daily (nightly) routine. I wanted the site to be able to alert me to important technical developments in stocks that I was stalking or that I owned. I was explaining that to the guy I was speaking with when I said "here, let me pull up my watchlist on my phone and show you". I had no idea what I was going to see but I was smacked in the face by one stock in particular -- MBLY. 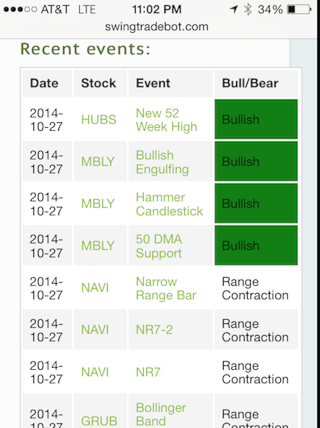 I've been tracking MBLY looking for a long setup and the first thing I saw (see image above) was three bullish indicators for MBLY (a bullish engulfing pattern, a bounce off of the fifty day moving average and a hammer candlestick). I couldn't have set up a better example of the power of using SwingTradeBot to track a watchlist if I had tried. It took me practically zero time to discover a setup in a stock that I've been wanting to buy. That other trader then saw the value of what the watchlist features can do. So give the watchlists a try, I think you'll find that they're a simple, yet powerful tool to help you stay on top of trading candidates.